On Tuesday a California jury found that Monsanto's herbicide Roundup caused cancer in a man who sprayed it on his garden over decades. 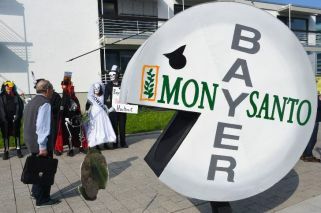 Shares in German chemicals and pharmaceuticals giant Bayer plunged as markets opened Wednesday, after a second US jury ruled that blockbuster pesticide Roundup -- made by recently-acquired Monsanto -- causes cancer. The Leverkusen-based group's stock toppled 11.6 percent to US$69.88 at around 8:40 GMT, making it the worst performer on the DAX index of blue-chip German shares. On Tuesday a California jury found that Monsanto's Roundup -- a herbicide built on active ingredient glyphosate -- caused cancer in a man who sprayed it on his garden over decades. It was the second such ruling within a year against Monsanto, with a first coming in August last year soon after Bayer sealed its $63-billion takeover of the firm. Since the merger was completed, Bayer's stock has shed almost 40 percent of its value. The California court has yet to decide whether Monsanto is liable for amateur gardener Edwin Hardeman's non-Hodgkins lymphoma, after its Tuesday finding that Roundup was a "substantial factor" in causing it. In the previous case, brought by groundskeeper Dewayne Johnson, the firm was ordered to pay US$289 million in damages, an award later reduced to US$78.5 million and which the firm is appealing. Cases so far have found Bayer's attempts to convince jurors with scientific evidence struggling against plaintiffs, who point to a finding from the International Agency for Research on Cancer (IARC), an arm of the World Health Organisation. The body listed Roundup as "probably carcinogenic" in 2015. But Bayer points to more recent decisions from regulators around the world and reams of scientific studies as proof of the safety of its product.